The term middle-age spread refers to the weight gain that occurs during menopause. Ninety percent of women experiencing menopause can expect to fall prey to “the spread,” which, on average, adds about 10 to 15 pounds to a woman's figure. Continue reading to learn more about the middle-age spread and factors contributing to the weight gain to achieve an ideal weight. Menopause is characterized by a time of hormonal uncertainty as ovarian hormonal production begins to wind down, principally of estrogen. 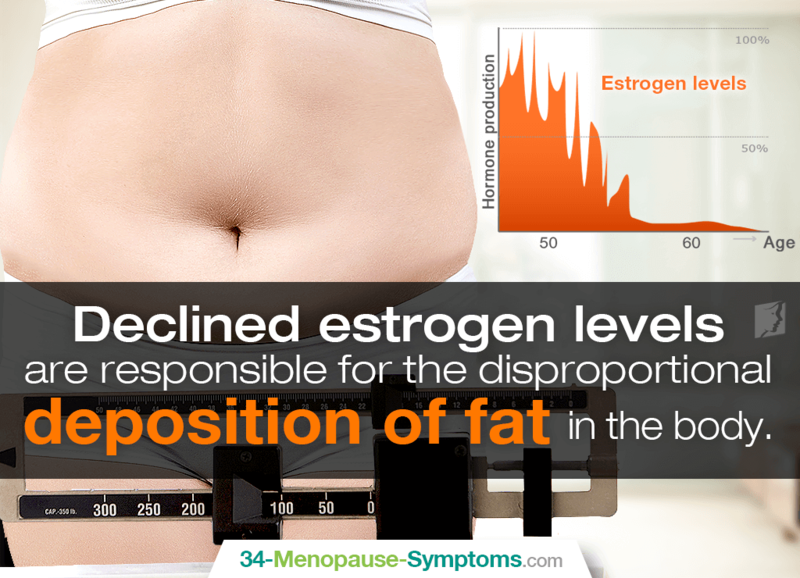 Declined estrogen levels are responsible for the disproportional deposition of fat in the body. Accordingly, women who have been able to maintain a healthy body weight throughout their reproductive lives can be presently suffering from a redistribution of fat to the abdomen (apple-shaped obesity) in addition to increased appetite and decreased lean body mass. While hormones play a large role in menopausal weight gain, they are not solely responsible for those few extra pounds clinging to your waistline. Poor sleep quality. Two other hormones responsible for your hunger response change roles when you don't sleep well, which could be due to sleep disorders or night sweats. Levels of ghrelin, the hunger hormone, rise while levels of leptin, the fullness hormone, drop. This can lead to unhealthy, late-night munchies and the midlife spread. Sedentary lifestyle. Menopausal women often struggle with fatigue, muscle pain, joint pain, and osteoporosis, all of which might reduce their mobility. As such, they don't burn the same amount of calories being sedentary as they did before, and a lack of physical exercise results in a decrease in muscle mass and an increase in body fat. Eating habits. If eating habits continue to fashion those of younger years, women will be more susceptible to weight gain, especially after metabolism slows and appetite increases. To maintain current weight - not talking about losing extra pounds - you may need 200 calories less than in your 30s. There are various natural methods available to treat menopausal weight gain before the midlife spread gets the best of you. For starters, you can fight menopausal weight gain by making simple lifestyle and dietary changes, like getting regular exercise of 150 minutes weekly - consisting of a combination of aerobic and muscle-strengthening activities - and avoiding calories from added sugars in your diet, coming from soft drinks, juices, sweetened coffee, tea, etc. If you must snack, make smarter choices of vegetables, fruits, and whole grains, options that are less processed with higher fiber content. However, improved results occur by adding phytoestrogenic supplements - black cohosh, St. John's wort, red clover, etc. - or hormone-regulating supplements, like Macafem, into the mix. Both help balance the hormones mainly at fault for your extra pounds, but in their respective ways.